If you want to know how Vladimir Putin looks like with a gun - here is a picture, though it's taken years later than the 1990s, of course. 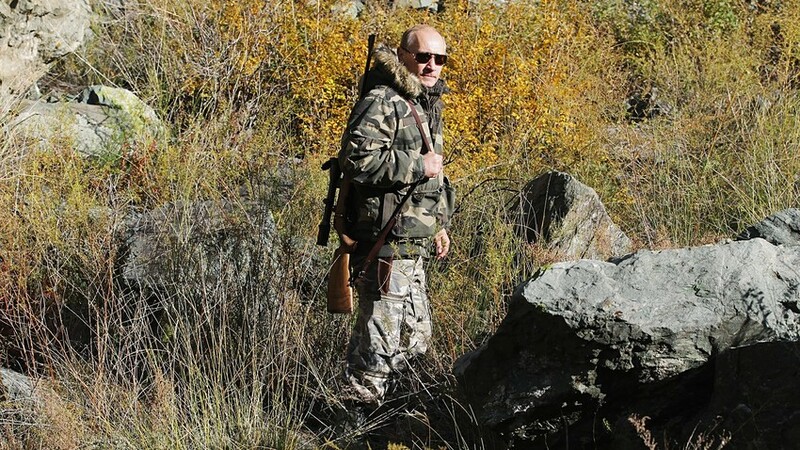 This is Putin on an expedition to Ubsunur Hollow Biosphere Preserve. In a new documentary about the President of Russia, Putin revealed some details touching upon his life in St. Petersburg and Moscow during the 1990s, a decade deeply associated with instability and a dire economic outlook. From 1990 to 1996, Putin worked as an advisor to St. Petesburg mayor Anatoly Sobchak, and, as it turns out, life was hard on him as well. “In my country home, I had to put a pump-action shotgun near my bed, this is true. But these were the times back then – better to be safe than sorry,” Putin recalls – assuring us that this was just to guarantee his own safety. At the same time, he said that reports of horrible crime rates in the 1990s are exacerbated to a large extent. The politician also mentioned that he had been in a tough financial situation after Anatoly Sobchak lost the St. Petersburg mayoral election in 1996. He even considered becoming a taxi driver. “I’m not joking. What other choice did I have? I had two small children [to provide for],” Putin said. Nevertheless, life turned out differently for him: Putin soon moved to Moscow where his career in President Yeltsin’s administration started. Want to know more about Putin's life before becoming a politician? We have a special piece on his life in East Germany as a KGB agent.